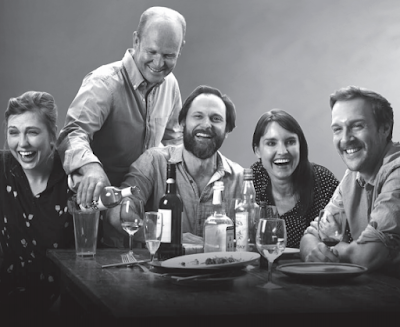 The Ensemble Theatre presents, THE NORMAN CONQUESTS, Three Plays by Alan Ayckbourn, at the Ensemble Theatre, Kirribilli. 19th October - 12 January. THE NORMAN CONQUESTS, are three plays: TABLE MANNERS, LIVING TOGETHER and ROUND AND ROUND THE GARDEN, by Alan Ayckbourn, written in 1973. They are famously recognised as one of many masterpieces from this author who has written some 82 plays and is still writing. These three plays have the conceit of happening all at the same time, just in three different spaces. The first in the Dining Room. the second in the Living room, and the third in the Garden. Each play can stand independently and the entertainment hilarity is extremely rewarding. See all of them and the compound knowledge they you acquire about what is happening in the other spaces doubles and then trebles the comedy reward. They can, by-the-way, be seen in any order. Annie (Matilda Ridgeway), is in the country home looking after an ill mother (who we never see) and on this particular weekend has arranged for her sister, Sarah (Danielle Carter) and her husband, Reg (Brian Meegan) - they have two children - to come and take over mother's care to give herself a break. Annie has planned a secret weekend tryst with her brother-in-law, Norman, a shaggy librarian (Yalin Ozucelik), who is married to her other sister, business woman, Ruth (Rachel Gordon). Annie, also, has a vague local neighbour, Tom (Sam O'Sullivan), a vet shambling around the place, who the others hope she will marry! Nothing works out the way anything was planned. These intensely middle class no-body's, catastrophize their special knowledge of their siblings, of their marriage partners, and of the 'hopefuls', in a recognisable observation of the mundanities of the human species to an outrageously funny scale. And what is especially wonderful, is the accuracy and complexity that Mr Ayckbourn builds in the psychological portraits of each of the six participants with a piercing but empathetic eye - his eye for detail, and home truths are extremely perceptive and cozened in an ironic and wry sense of humour. Being a Chekhov fan, I recognise the forensic nature of Mr Ayckbourn's play, and like in Chekhov, recognise Mr Ayckbourn's wicked sense of the ridiculousness and his crafty sense of farce, the comedy of just being alive and surviving, at a graduating scale. Directed by Mark Kilmurry, the plays are beautifully revealed and 'hum' along with all the confidence of a well oiled machine. The dramaturgical skill of the comic and dramatic formula of the writer's cleverness is immaculately understood. Mr Kilmurry has also selected a wonderfully accurate group of actors who have created real, vulnerable people, and who then, instinctively, have let their comic instincts stretch to the needs of the writing for it to reward the audience with six hours of blissful laughter, and an ultimate identification of compassion for these hapless, ordinary people, who, if we dare to contemplate, are much like ourselves and our extended families, extended or close. Danielle Carter is the 'roaring' engine of this machine, and the neuroticism and self-possession of her Sarah drives and buoys the action. Ms Carter creates a wonderful energy while acknowledging the complexity of the frustrations of Sarah's predicament. At the other side of the comic energy input, Sam O'Sullivan's Tom, the vet with no real personable understanding of his own species, bumbles, round-shoulderly, through the strifes of a world he hardly grasps the logic of. The conflict of dramatic/comic tempo is hilarious. Matilda Ridgeway, as Annie, the plain Cinderella at the centre of the weekend gives a remarkably reserved and perceptive quizzical frustration to all that happens - it is one of the best pieces of work that I have seen given by Ms Ridgeway - and the contained stamina of it all is wonderfully admirable. Rachel Gordon's Ruth, the brusque, sensible business woman, the wife of the wayward protagonist of the collective, Norman, although literally short sighted - in want of glasses - has the best sight of a truth seer and surprises us with her counter intuitive re-action, a 'wisdom' - it appears to be an effortless contribution. Brian Meegan, as put upon, but dependable Reg, gives a performance of such subtle nuance that is both hilarious and yet so demanding of us to give empathetic care and identity, that it could almost be the best of the performances on the stage. Though, that is difficult to claim amidst the talent of this production - it will be a matter of personal taste. For, Yalin Ozucelik, as the Norman, the man of insatiable conquests, eponymous Norman, is spectacular in the precision of his comic intelligence and plastic gesture so that despite Norman's near despicable self, creates an affection from us that we might give a wagging-tailed labrador. This company of actors will, each, reward you, undoubtedly. What greatly assists is the Set and Costume Design of the three plays with all the attendant detail of everyday living in a long lived-in domestic house, by Hugh O'Connor, who is delightfully perceptive with just the right detail of prop and costume to be able to give the audience the imaginative spur to fill the whole space and characters with a history and familiarity. Each of these beautifully curated Designs are enhanced by the Lighting Design of Scott Allan. THE NORMAN CONQUESTS I saw, in an all day sitting:1.00pm. 4.30pm and 8.15pm. My guest and I were as fresh with stimulated energy at the end of the night as we had naturally had when we arrived at the theatre. Now, that is nearly nine hours at the theatre. Six hours watching and laughing. Three hours recovering and reflecting about the humans we are. What a wonderful night, or two, or three at the theatre. What a wonderful gift for the seasonable end of the year. Go see why Mr Ayckbourn is so revered. Go and enjoy a performance so lovingly and wonderfully fulfilled by this team of artists. The Ensemble at his modest clever best. Highly recommended.